Can Apple make video calling popular? Take a look at the mobile phone you own – does it have a camera on the front of it? If it does, chances are that its capable of making video calls. That’s right, another feature they stamped all over the box that you never actually use – and for good reason. To date, video calling on mobile phones has been a pretty average experience. Video calling was initially a much-hyped feature introduced with the first wave of 3G phones. I remember reviewing 3G handsets for the Herald back around 2006-7 when the mobile operators still expected them to be a major revenue-earner. It was uinreliable, awkward to use and trying to keep your face in view of the camera while your callers face appeared as a blotchy purple blob on a tiny screen wasn’t a very satisfying experience. Instead, people kept texting and while video calling has been bundled into calling plans from the likes of Vodafone, I am yet to actually see someone making a video call to another mobile user – other than journos trialing the service so they can write up a review of it. That’s despite camera resoulution improving and video calling essentially becoming a one-button action. What has become big in the intervening years, spurred on by web cameras being increasingly built into laptops and even desktop computers, is video-calling via the likes of Skype, Windows Live Messenger. Everyone gets webcamera calls between computers, but the video on the phone is a different story. So the debut of Facetime, a new feature of the revamped iPhone version 4 that allows video chat between iPhone users – and potentially users of Windows Mobile and Google Android phones too, is a curious addition for the company that didn’t see much point in putting a video camera on the front of the iPad version 1 – something that in combination with Skype would have been incredibly useful. 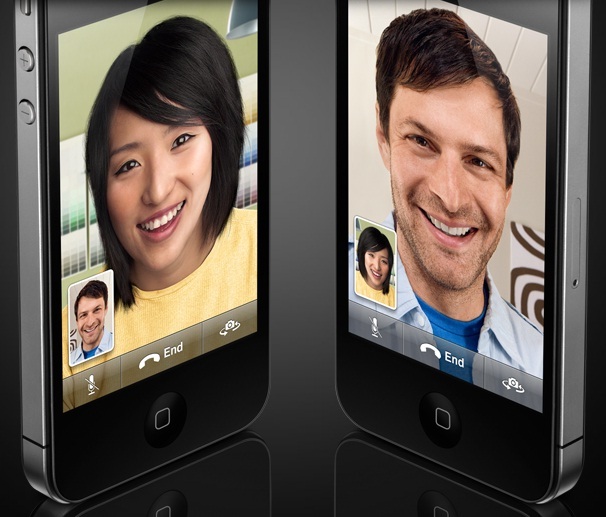 Facetime is one of the headline new features of the iPhone 4, along with a high-definition camera, an incredibly high resolution screen and multitasking functionality. Intriguingly, Apple appears to have created FaceTime with the potential to make it compatible with other types of phones. Apple obviously realises that third party software players like Skype and Fring are increasingly attracting mobile users who want to make the occasional video call on their phone. Apple itself touched on what’s probably its biggest shortcoming at the event Monday: It will work only over Wi-Fi. That limitation automatically restricts where you can use FaceTime. So while Apple touted the ability to share special moments with your friends and family, you better make sure those moments happens near a hotspot. If they don’t, you can’t share them. In other words, don’t expect to show grandma your son or daughter’s soccer game anytime soon. Apple said it’s talking to its wireless carrier partners, including AT&T in the U.S., about being able to use FaceTime over their networks, but it also said that at least for this year, it will be Wi-Fi only. And the wait could be longer, given the problems networks have had in supporting the amount of bandwidth iPhone owners already use. Fundamentally, do people want to video chat to each other on their mobile phones? Not really, I don’t think. There’s a certain self-consciousness to being on the phone that really governs people’s use of mobiles. It has to do, to some extent, with privacy, but I think in general people are just more comfortable talking on the phone and sending short messages, than having a face to face video call – especially in public. But there is a market for this. As one blogger has pointed out, video blogging, video surveillance and even video dating have potential. If anyone can bring it to the mainstream it is Apple. But I don’t see the dominance of text messaging diminishing anytime soon. There’s something about the convenience, speed and brevity of tapping out a text that will keep it a major part of the mobile user’s toolkit for some time to come. I’m a self confessed weirdo who often doesn’t follow social conventions so it’s hard to extrapolate my own vehement distaste of the idea to the wider population.